You don't have to worry about pruning tender, annual herbs, like basil, dill, and cilantro. These plants are pruned as you harvest them and they are only around for one growing season, sometimes for only a matter of weeks. However perennial herbs that develop woody stems, like lavender, oregano, sage, thyme, and rosemary, generally need some type of maintenance pruning. Most woody, perennial herbs don’t require pruning to grow. Left to their own devices and given the right growing conditions, many will become shrubs or carpets of ground cover. However, as with most perennial garden plants, some judicious pruning will improve the look and vigor of the plants and keep their size and shape in check. More importantly, pruning spurs tender, new growth, which will have the best flavor, and limits the amount of woody, non-leafy stems. A plant that is allowed to grow leggy and become woody will eventually split open in the center and flop over. Pruning, other than the pinching down you do when you harvest your herbs, is best done in the early spring, once new growth starts at the base of the plant. A second pruning can be done after flowering, to remove the spent flowers and send the plants energy back into growing fresh leaves and a strong root system. Don’t prune late in the season. You don’t want to encourage new growth when the plant is trying to go into winter dormancy. Tender new leaves will be killed by frost or harsh winter temperatures and this can stress and weaken the plant. Wait until you see signs of new growth, before pruning woody herbs. This usually starts in early spring. Once you see signs of green, you will know the herbs have broken dormancy and are actively growing. At that point, remove any dead or broken wood. Larger, shrubby herbs, such as lavender, rosemary, and sage, thyme, don’t require much additional pruning at all unless they’ve become leggy or overgrown. If that's the case, go ahead and shape them or prune them back by up to one-third. 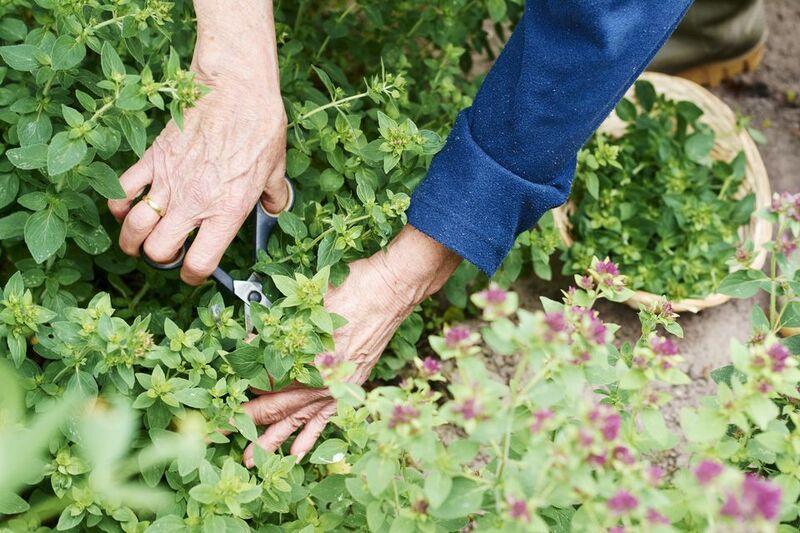 Softer woody, perennial herbs, such as germander, marjoram, oregano, and winter savory, can be cut back by 1/2, to get rid of old foliage that may not have been harvested the year before and to spur new growth. Even if your woody herbs don't look like they need a trimming if you did not cut the flowers when the plant was in bloom, remove the spent flowers now. Cut the stems back to a pair of leaves, no more than 1/3 of the way down the plant. Lavender plants may need special treatment if you are growing them in the flower garden for their ornamental appeal. You don't want to simply lop them off across the top or you will get an unnatural looking lavender plant. Learn how to prune your lavender plants, to keep them fragrant, attractive, and to help them better survive less than ideal winters.